TODAY MARKS the end of an era. Today, at 3:18 AM, Lee Kuan Yew, the founding Prime Minister of Singapore, died. I remember telling my family yesterday how uncharacteristically it rained so hard in Singapore. Not a ray of summer sunshine could pierce through the dark clouds. And the heavens cried for hours on end. Now I think I know why. The heavens seemed to have wept with the people of this city state. 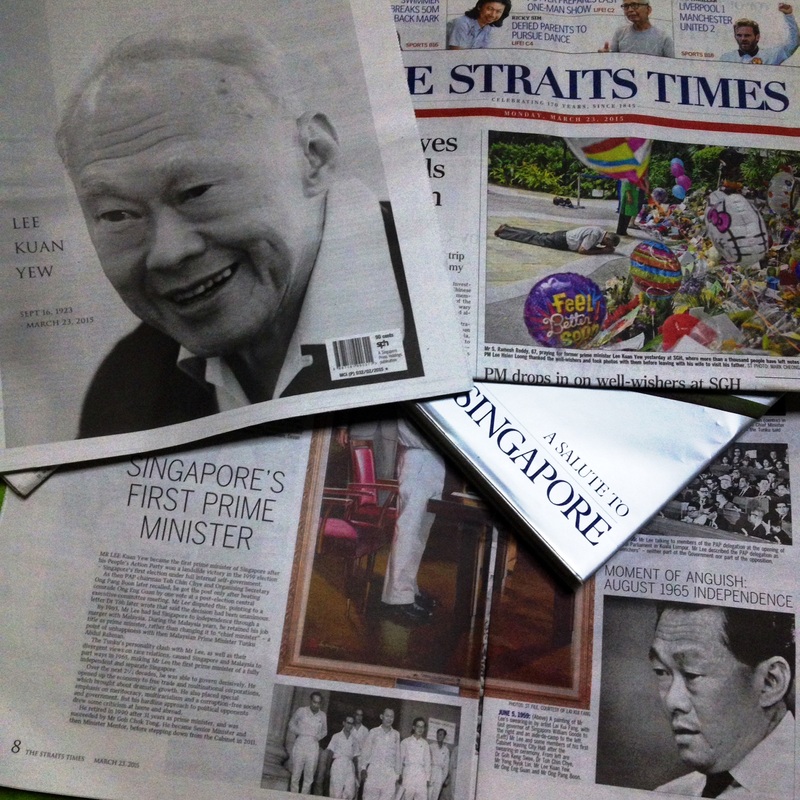 As a Filipino living in Singapore, all I know about the late Lee Kuan Yew, I had heard from my father who is outstanding in Math and World History; read about in books; and, heard from a Philippine Presidential candidate who promised to rule my country after how Lee Kuan Yew took Singapore from Third World to First. His accomplishments and all the odds he had to overcome aside, I feel that what he possessed – which is the hallmark of any great leader – was charisma. All things being equal, that unspeakable quality set him apart. It is palpable from even the black and white photographs that have flooded the internet at the news of his passing. Walking back to the office from lunch at the market, I passed by groups dressed in somber tones of black, grey, and navy blue, engaged in pocket discussions extolling the exemplary man that was Lee Kuan Yew. It almost felt like the Little Red Dot is his one big family mourning his loss. Having lost my own dearest grandmother a couple of years back, I couldn’t begin to imagine how today’s event must feel for the seven grandchildren left behind. I’m an outsider and I do feel particularly sad too. Singapore marks its 50TH birthday this year. With its founding Prime Minister’s passing in the same year, it just further underscores what Lee Kuan Yew had helped make possible. He left – and will always be remembered – as a most accomplished and beloved man. I would never be able to lay claim to originality with this line: “Lee Kuan Yew was Singapore.” But I think this is one of those things that transcend the boundaries of mortality. I think Lee Kuan Yew is and will always be Singapore. Farewell to Singapore’s Founding Father, Prime Minister LEE KUAN YEW, September 16, 1923 – March 23, 2015. Thank you for sharing. I am very impressed with what 50 years has done for Singapore. Of course it was Singapore itself that picked itself up to become what it is. This did not happen by chance.